EDITOR'S NOTE: When I received notice of this exciting upcoming show in a brand-new gallery space, I felt that Gallery Walk patrons would want to know about it, even though it's the following weekend. An intriguing collaboration of five artists is preparing to exhibit at a new gallery in downtown Brattleboro. The weekend exhibit and special sale is being promoted as "5 ARTISTS 3 DAYS" and will feature paintings and prints by Petria Mitchell, Mallory Lake, Jim Giddings, Carolyn DiNicola-Fawley, and Bobbi Angell. The newly renovated Gallery at Headroom Stages -- in the "MarketBlock" building at 17 Elliot Street -- will be open on Friday, December 10, from 5:30 to 7:30, followed by afternoon hours on both Saturday and Sunday, December 11 and 12, from noon to 5:00 p.m. For additional information call (802) 257-4021. The show presents a rare opportunity to purchase works directly from these artists. All five show nationally and internationally and have works in both private and permanent collections. 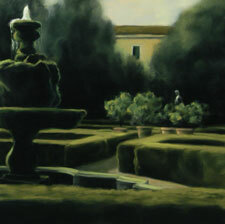 Their work represents a broad range of styles and techniques, and each artist exhibits a true passion for, and a great understanding of, their subject matter. 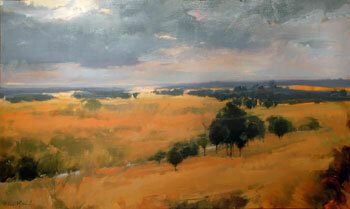 Petria Mitchell's dramatic and glowing oil landscapes bear her signature bold and expressive brush strokes. With line, shape, and color, Mitchell creates tension and high drama in her paintings. 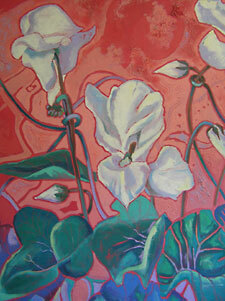 Her compositions deliberately lead the viewer's eye throughout the canvas and provide a powerful visual experience. The luminosity of her colors engages the viewer's emotions. She is represented by Lanoue Fine Arts on Newbury Street in Boston, The Harrison Gallery in Williamstown, Massachusetts, and Green Mountain Fine Arts Gallery in Stowe, Vermont. 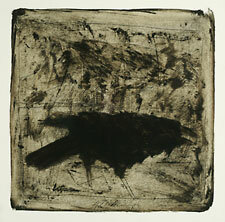 Exhibiting drama of another kind is pastel artist Mallory Lake. Lake creates luminous pastels of Vermont and European landscapes that employ atmospheric lighting with simplified detail and composition. The result is a soft focus and the dominance of a single hue in the tradition of the Tonalists, who rejected intricate detail in favor of a more intimate expression. Lake's work extracts the essence of her experience in the landscape by diminishing the impact of features that detract from it and heightening those that best convey the impression. Mallory Lake's work is represented by Pucker Gallery of Boston; William Baczek Fine Arts in Northampton; Martha Keats Gallery in Santa Fe; Rice/Polak Gallery in Provincetown; and Ober Gallery in Kent, Connecticut. Jim Giddings' highly charged oil stick paintings on paper (see page 5) present powerful and graphic images of landscapes, birds, and human forms. His interest as an artist is clearly about surface, texture, and density. Frequently monochromatic, the carefully attended surfaces become tapestries of brush strokes and scrapes, and emphasize print-like qualities of paint-filled lines and restricted color schemes. Giddings is a graduate of Amherst College and has taught art classes in Deerfield, Massachusetts and Cleveland, Ohio. Carolyn DiNicola-Fawley is taking a spell from representing fish and ice huts in her paintings, yet water still plays a part in her latest oils and pastels, in which she presents flowers in a less traditional approach. Carolyn breaks rules of formalism as she presents arrangements of flowers in antique vase forms in the center of the canvas or paper. She displays her love of line and color as she strategically etches colorful, mini ghost-like vase images suspended by webs of line throughout the piece. DiNicola-Fawley's work appears in many private and public collections throughout New England, the San Francisco Bay Area, Colorado, the Midwest and Southeast, as well as in Germany and Italy. Artist, illustrator, and printmaker Bobbi Angell is also intrigued by the beauty and intricacy of flowers and botanicals. Well known for her New York Times drawings and scientific illustrations, Bobbi has turned her skills to the traditional process of intaglio printmaking. Her detailed copper etchings, printed in limited editions at Twin Vixen Press, provide a focused and intimate view of beauty that usually escapes the naked eye. Angell's work demonstrates her competence as both a fine artist and a botanist who finds endless inspiration in her own gardens. 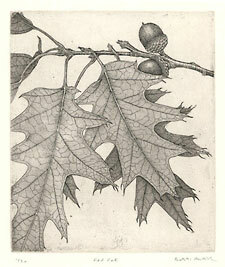 She is represented by Albright Art Gallery in Concord, Massachusetts. This exhibit also offers the public a rare chance to view such a wide variety of inspired art within a single gallery space. All five artists will be available during the show to discuss their work with visitors.